Trump Rode a Wave of Economic Angst. Will He Harness America’s Greatest Economic Opportunity? Trump’s campaign stoked fears about economic change. His energy policy could deliver a trillion-dollar payoff for America—if only he’d recognize the positive changes sweeping the sector. Donald Trump forged an unlikely path to the White House by targeting the fears of Americans who feel left out of the global economy. Trump's brand of economic populism is rooted in the belief that the U.S. is in decline -- that a caustic mix of immigration, loss of industry, stagnant wages and rapid technological change have created fewer opportunities for American workers. Trump seized on this angst in the energy sector, where coal workers have been hit hard by declining demand for the resource and increased mechanization in mining. From 2010 to 2015, America lost 25,000 jobs in the coal mining sector. That decline started decades ago. Similarly, tens of thousands of jobs have been lost in oil and gas extraction since 2014, after global oil prices crashed and drilling activity slowed. 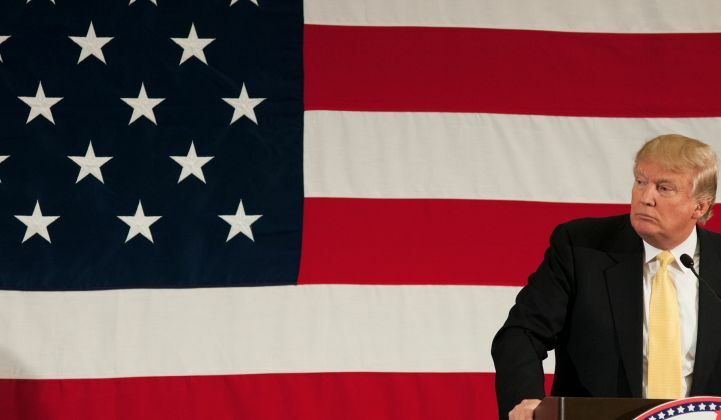 Trump has called these market-driven changes a "war on the American worker" and has promised to "unleash an energy revolution that will bring vast new wealth to our country." But an energy revolution is already underway in the country. It is clean. It is cutting-edge. And it is creating vast new opportunities for jobs and wealth creation. The advanced energy market -- which includes renewable energy, building efficiency, electric vehicles, energy storage and cleantech manufacturing -- is worth $200 billion in the United States. That's worth more than the pharmaceutical industry, and almost worth as much as the consumer electronics industry, according to Advanced Energy Economy. There are now almost 210,000 Americans employed in the solar industry. That's a doubling over 2010 figures. The solar industry alone has created one out of every 80 jobs in the U.S. since America emerged from recession in 2009. In the next four years, there could be more than 420,000 people working in the sector, according to the national solar jobs census. 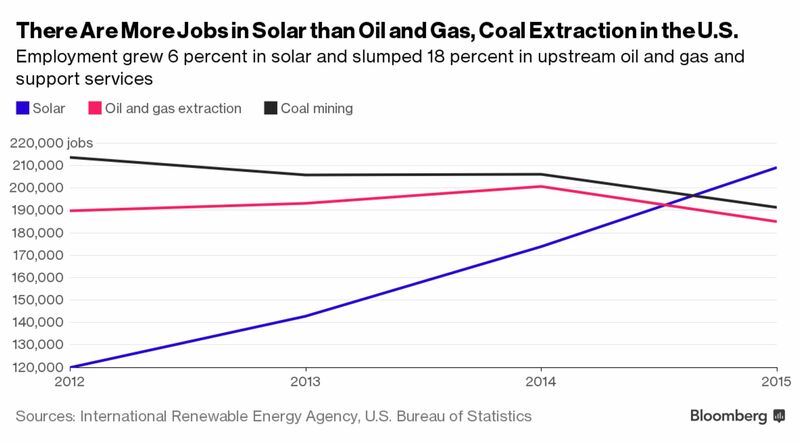 The solar sector now accounts for more jobs than oil and gas extraction. And the fastest-growing occupation in the country? That would be wind turbine technician, reports the Bureau of Labor Statistics. These jobs are the result of putting steel in the ground and boots on rooftops. There are now well over 1 million homes with solar. In just two years, there will be another million systems installed on residential rooftops around the country. Last year, wind, natural gas and solar made up 97 percent of total power plant capacity additions. 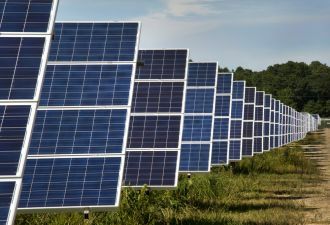 This year, it's possible that large-scale solar power plants will outpace any other energy source in terms of new capacity, according to government data. Jigar Shah, a man who literally wrote the book on the clean energy wealth opportunity, summed up these trends: "The American energy economy is changing, and changing rapidly. Clean energy and energy efficiency are where the growth is happening. We can move of millions people from coal mining, low-tech manufacturing, and even oil and gas into well-paying jobs that don’t negatively impact the health of people and the planet." They can be summed up even more powerfully in a simple chart. "Ours is the campaign of the future," declared Trump in an August speech on the economy. But over the course of the campaign, Trump has belittled the cutting-edge clean energy sectors that are growing fastest, while making empty promises about revitalizing a coal industry that Goldman Sachs says is in a "long-term" and "irreversible" decline. Compared to the dark tone of his campaign, Trump's acceptance speech was unusually positive. "We will embark upon a project of national growth and renewal. I will harness the creative talents of our people, and we will call upon the best and brightest to leverage their tremendous talent for the benefit of all. It is going to happen," he said. That growth and renewal is already happening in the energy sector. The creative talents of entrepreneurs, engineers, construction workers and executives are all being directed at the clean energy transition. And they are collectively fueling a $200 billion market that is still in its infancy. Trump's campaign stoked fears about economic change. His energy policy could deliver a trillion-dollar payoff for America -- if only he'd recognize the positive changes sweeping the sector.